Dixon School, Chicago, Illinois, 1938. 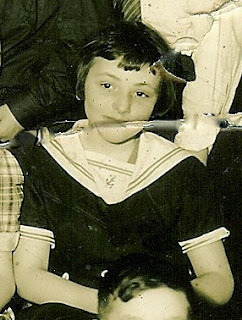 My mother, Joan Joyce (Schiavon) Huesca, was quite the storyteller all her life, a skill most likely passed down by her Irish ancestors, the Quinns, McCoys, Gaffneys, and McGinnises. Two months before her death in 1987 at the age of 59, she determined to put down on paper as many stories of her own life as she could, for the benefit of her four daughters and her future descendants. Although she was unable to finish her book, what she managed to write was considerable and candid, even through her constant pain. In this excerpt from her book, Joan Joyce Schiavon Huesca: an Autobiography, she remembers childhood adventures with her best friend, Rosemary Reize. “We were living in the home that my Grandfather, Thomas Eugene McGinnis, had built in Chicago, Illinois. The address was 8336 Drexel Avenue. I remember the house as what was then called a ‘bungalow,’ with a large garden and yard in back of the house. We had a large basement, which flooded almost every year. One time, a client of my Father gave us a pet duck, which we named after a radio comedian of the time, ‘Joe Penner.” On one of the flooding occasions, there was the duck, paddling along in the water almost to the top of the stairs! We had an attic, too! There were two rooms in the attic. One was a bedroom for my Brother Tom. The other room as a ‘catch-all,’ with many wonderful things stored away. I would spend hours there, playing many wonderful things stored away. I would spend hours there, playing ‘dress-up,’ or putting on little plays and charging my friends a pin to attend these fabulous productions. “My bedroom was opposite that of my parents. I was just remembering the other day, how unique was my closet! There was a little window in the closet! I spent a lot of hours there playing with my dolls. There were twin beds in my bedroom, one which later was shared by my Grandmother Schiavone when she came to stay with us. “I was about six or seven years old when I met my ‘best friend.’ I had taken my dolls for a walk, and wandered over a block from our house, and found myself in the back of a large apartment building, and saw a little girl through a basement window. Friendly me, called out, ‘Hello!’ and my ‘soon-to-be-friend’ proceeded to drench me with water. Thus began many precarious adventures with Rosemary Reize, my ‘best friend’! Rosemary was a very pretty little girl, with light blonde curls, and lovely blue eyes. I was quite the opposite. By this time, my mother had begun to bob my hair, and I was a brunette with big brown (meat-ball) eyes. Rosemary was the leader, and I the dutiful follower, as you will see, as I tell you of our many misadventures. “We collected milk bottles from the back porches of the neighborhood, with the idea of collecting a deposit for them. We walked blocks and blocks to the nearest dairy, only to find that there wasn’t any deposit. “Rosemary’s Grandmother had been given a scrungy little dog who apparently had been mistreated. We took the poor animal down to the basement, to give him a bath, and put him in the old-fashioned washing machine! The poor thing emerged, alive, but minus all his fur. “Rosemary lived on the third floor of the big apartment building, and decided to see how fast the dog could get down the back stairs, so she put roller skates (one for his front paws, and one for his rear paws) on the poor little dog. Then she gave a big PUSH! Needless to say, the dog soon died afterward. 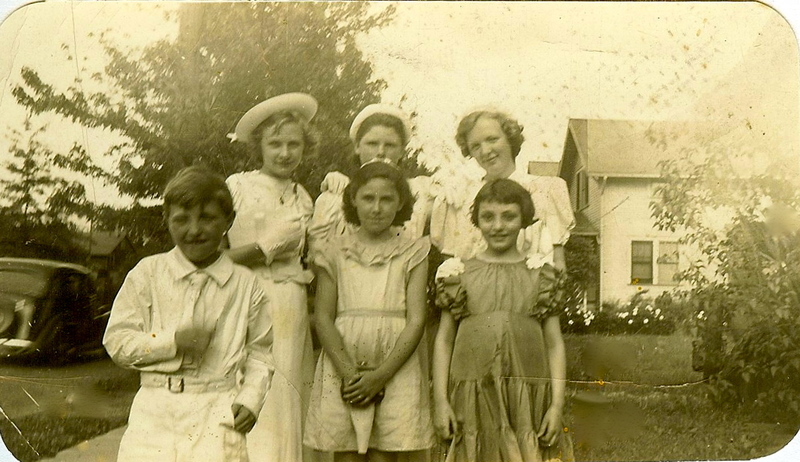 My mother, Joan Schiavon, first row, far right. could one of them be Rosemary Reize? 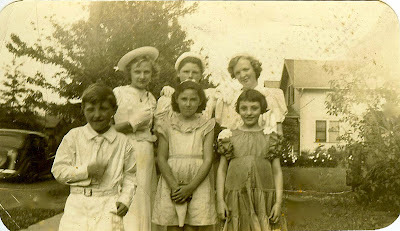 Postscript: I will add my own memory of my mother and her friend Rosemary’s escapades here. One Saturday afternoon, when I was about four or five years old, my father packed my sisters and me into the family car, and we took my mother to Rosemary’s apartment, so Rosemary (who had married and now was Rosemary Mager) could color my mother’s hair. At the time, the TV show I Love Lucy was popular, and Lucille Ball’s red hair appealed to my mother, who was a natural brunette but dreamed of being a gorgeous redhead, like the comedic star. We returned a couple of hours later, everyone excited to see the results. As we waited in the living room, I remember standing near the door to the kitchen, waiting breathlessly for my gorgeous mommy to appear. After what seemed like an eternity, she and Rosemary emerged, beaming. But for some reason, she was unaware that her hair was a flaming bright orange, nowhere near red. She did not look like a movie star at all. In fact, to me she was unrecognizable. Frightened, I began crying, “Where is my mommy? What have you done with my mommy?” My father looked back and forth from her to me, grinning, his eyes wide as he tried in vain to console me that this was my mother. But I could not be persuaded. My mother, who had expected all of us to love her new hairdo, just stood there for a moment in shock at our reaction. She walked over to a mirror and looked at herself, turned around and wordlessly walked back into the kitchen with Rosemary following closely behind her. My father, chuckling by now, scooped us up and spirited us out of the apartment again. He took us to a movie this time, probably to distract everyone from the hair-dyeing fiasco. When we came back for my mother the second time, my father practically had to drag me into Rosemary’s kitchen to see my mother, who was sitting with Rosemary at the kitchen table, drinking coffee. Her hair had returned more or less its natural color. I was so relieved to see my mommy again that I hugged her tightly. She sniffled softly, her cheeks moist, as she squeezed me back. Our family moved in the mid-1960s from Chicago to Mexico City and a few years after that to California. My mother and Rosemary kept their friendship alive, exchanging letters and Christmas cards. Rosemary phoned my mother when she learned of her illness. They talked for over an hour, catching up on their lives and reliving memories (one of these being something about them as teens, many moons ago, freeing some horses from the county fair and then running for their lives to avoid getting caught). When she hung up the phone, my mother said she felt like a young girl again. After all those years, Rosemary could still make her laugh. previous Previous post: Motivation Monday: How Could I Compete with a Genius? I so enjoyed reading this! Thank you for sharing. Sounds like you have inherited your mother's talent for storytelling! I've enjoyed reading about your mother and Rosemary's antics. Thanks for posting! There is nothing more precious than our family. We are all connected in some way, like the branches of a tree. We explore those branches here, sharing family stories and information – some known and others yet to be discovered – so we can meet the people behind the names and gain insights into our own lives.